Daburn Viton® Sleeving is a braided fiberglass coated with a modified Viton® composite with exceptional physical and electrical properties. Up to 220°C MIL-I-3190/7 latest revision (Grade A). Exceeds req. of NEMA TF-1 and ASTM-D372. VW-1, Class 220. Flexible elastomer polyolefin tubing, resistant to aviation & diesel fuels, hydraulic fluids, & lubrication oils. It reliably protects wires, solder joints, terminals, connections and components from most industrial fuels, abrasion, & mechanical damage. Daburn DAFLEX SM320 is a large size, medium wall adhesive lined, large ratio, heat shrinkable tubing with a meltable adhesive liner. When 120°C is applied, the tubing will shrink to 1/3 of its supplied size. DAFLEX SM321 is a large size, heavier wall, adhesive lined, heat shrinkable tubing with a meltable adhesive liner. When 120°C is applied, the tubing will shrink to 1/3 of its supplied size. As the outer wall shrinks the inner adhesive liner melts & flows. 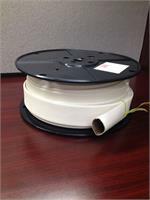 Daburn Non-Fray Sleeving is flexible, high-temperature secondary insulation made from heat-cleaned fiberglass braid. This Type HP is flexible and treated with an acrylic resin binder to further retard fraying and hold sleeving round for cutting. Daburn ETFE wire offers higher tensile & impact strength than PTFE, & greater dielectric strength & radiation resistance. ETFE, also known as Tefzel®, has excellent electrical properties & heat/chemical/flame resistance. Meets MIL-W-22759/16. Daburn ETFE wire offers higher tensile & impact strength than PTFE, & greater dielectric strength & radiation resistance. ETFE, also known as Tefzel®, has excellent electrical properties & heat/chemical/flame resistance. Meets MIL-W-22759/34. Daburn Expandable PET (polyethylene terephthalate) Sleeving is ideal for general all-purpose wire management and bundling in industrial, commercial and home environments. Easily expands for ease of installation and then pulls tight for snug fit. Daburn Expandable PET Sleeving is ideal for general all-purpose, flame retardant, wire management and bundling in industrial, commercial and home environments. Easily expands for ease of installation and then pulls tight for snug fit.